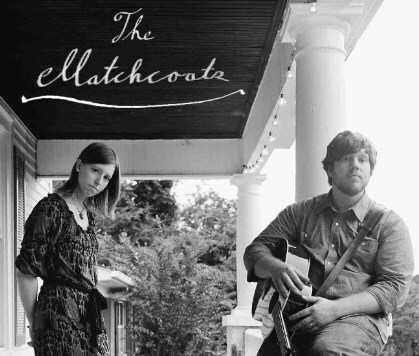 “Music was already an integral part of us,” Says Gabriel Akins of The Matchcoats. “We realized that we should make it together.” He and his wife Sarah Akins form a folk and blues duo that uses pleasant harmony and delta blues inspired guitar to relate songs of growing up and lessons learned along the way. Together, they’ve woven a sound that resonates with their Southern surroundings. There’s a clear focus on melody and harmony, with Gabe typically taking lead. His guitar style centers on the alternating bass technique of delta blues greats, especially Mississippi John Hurt. “Before we started playing a lot together, I used alternate tunings,” he says. “Sarah’s dad introduced me to Mississippi John Hurt and I really loved that style.” The guitar also supplies melody lines syncopated with their vocals. Their songs are typically mellow, but the overall pleasant sound of male/female harmony accompanied by Gabe’s guitar can easily bring a smile to your face. Sarah’s harmony compliment’s Gabe’s vocals and give The Matchcoats an extra layer of Americana. “She can sing a beautiful melody, too,” he says. “I’d like to hear her do it more in the future.” Sarah does take lead on occasion, even if it’s only for a rare verse. There’s undoubtedly some thought put into The Matchcoats’ lyrics. “We love to entertain, but we want to do more than that,” says Akins. “We’re trying to say something through the music.” Songs like “Coming Up” take a look at the process of growing up, with perspectives young adult. It features a charming guitar melody that brings out the innocence of the lyrics. “A prayer for Growing Up” and “Young Mouth Blues” add the consequences for childish indiscretions to the act of growing. You can find the Matchcoats on Facebook. Follow them on Twitter, too! Their music is also available on ReverbNation.